These apple squares are among my favorites and I regularly serve them when friends and family visit. 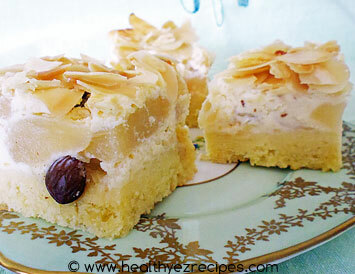 They have a cake-like base with a fluffy ricotta cheese topping which is filled with apple and sultanas. The whole thing is topped with toasted almonds. Ricotta cheese has a delicate taste, unlike cream cheese, so it’s not overly sweet. The apple and sultanas provide the sweetness, without being overpowering, while the toasted almonds add crunch and some extra flavour. The result is an absolutely delicious slice that delivers on taste without piling on the pounds. While the recipe does contain some butter and sugar, I like to think that the ricotta cheese, apples and almonds cancel them out, especially if you use reduced-fat ricotta and unsweetened pie apple. Preheat the oven to 180°C / 350°F. Grease and line a 23 cm / 9 inch square cake tin with parchment paper. First you need to toast the almonds. Line a baking tray with parchment or tinfoil, spread the nuts evenly and bake in the oven for 5 – 7 minutes. While the almonds are toasting you can make the base. Place the butter and sugar into the bowl of an electric mixer and cream together until light and fluffy. Add the eggs, one at a time, beating well after each addition. Add the flour and, using a knife, mix until a thick paste. Spread the mixture evenly over the base of the tin and bake in the oven for 15 minutes. Meanwhile, place the ricotta cheese, lemon zest and sugar into a bowl and beat with an electric mixer until creamy. Add eggs gradually, one at a time and beat thoroughly after each addition. Beat in the cornflour until just combined. Transfer the mixture to a large mixing bowl and add the sultanas, apple and half the almonds. Gently stir with a metal spoon until combined. Spoon the topping over the base, spreading it evenly with the back of the spoon. Sprinkle the remaining almonds over the top. Bake for 45 minutes or until the topping is firm and golden. Remove from the oven and leave to cool in the tin. When cold, remove from the tin and cut into squares to serve. These apple squares will need to be stored in the refrigerator and will keep for up to 2 days.